One of the figures I’ve been keeping my eye on is now up for pre-ordering at Hobby Search. It is the elegant fairy Mercedes from Odin Sphere. 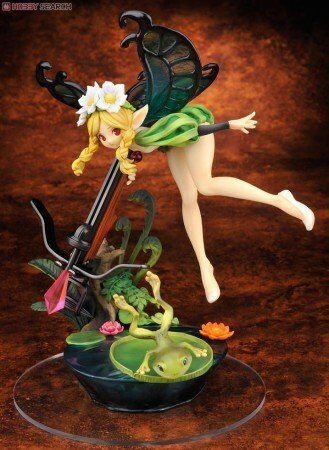 Alter’s first Odin Sphere figure, Gwendolyn, was absolutely stunning and I expect Mercedes to be as well. The preview images look great. I’m interested in how her wings will tun out as they seem to be translucent. 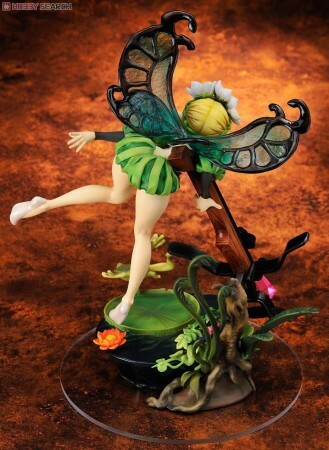 Quite tempting though will not come cheap at 7,410 yen for a 1/8 scale figure. Then again, it is Alter ^^; Mercedes will be released in February. I’m not too big on her design, but I must admit, that figure is superbly made. .-= Snark´s last blog ..Girl it up! – Fruits Basket #3 =-. Yeah, the thin green strips are a bit annoying. Superb craftsmanship, but not too great on some of the design. Awesome wings and base though. Bitchin’. .-= Guy´s last blog ..Blog Success. Part 1; Building. =-. .-= Leonia´s last blog ..Cocona – Movic =-. 7000Yen still seems ok, it’s a normal price for a 1/7 – 1/8 scale figure and alas we’re seeing lots of figures lately in that scale range that go far above that price. But she looks like she’s worth it! .-= Smithy´s last blog ..C76 loot has arrived =-. Yeah, there have been more expensive figures but 7,400 still seems a bit high. Ah well, seems to be the trend. She’s a really nice figure, one I’m deciding if I’ll buy or not.